We've all heard stories of high school guidance counselors offering motivation for students and student athletes, but nothing quite like this. 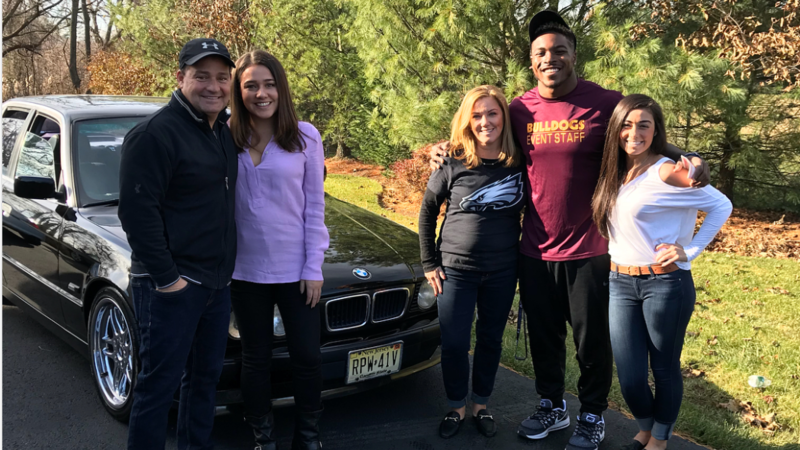 When Philadelphia Eagles running back Corey Clement was attending Glassboro High School in New Jersey, he dreamed of playing in the NFL. He also admired a certain car: the BMW of his high school guidance counselor, Mary Beth Ragozzino. Are you putting two and two together? Yep, she went there. Ragozzino promised Clement that if he worked hard in school and reached his goal of making it to the NFL, she would give him her car, the car he always asked about. Clement was all smiles as he checked out his new ride and took some pictures with his former counselor in her Eagles attire. You might be thinking, why does a first-year NFL player need to be taking a car from his former teacher? As an undrafted rookie, Clement was guaranteed a total of $35,000 on his rookie contract, a three-year deal. By maintaining a spot on the Eagles' roster through 11 weeks, he has earned about $320,000 in base salary and is due another $145,000 through the end of the regular season. With Clement earning his place in the Eagles' offense, perhaps this motivational act from his counselor will be reciprocated in the future.